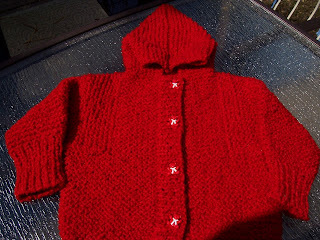 Made two little hoodies from some donated anonymous yarn - almost like a chenille in thick chunky delicious red - this is the Elizabeth Zimmermann Tomten pattern which I love and am (almost) as addicted to as the Baby Suprprise Jacket! 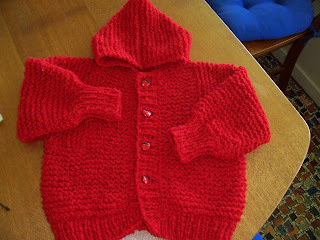 The original yarn had obviously been wound into balls - although I am not sure it had ever been knitted up before. It smelt strongly of cigarettes (ewwww!) and had bits of grass and stuff in it too. But a nice warm wash in shampoo and a rinse in apricot conditioner made it good as new, and it smelt much nicer too! I made two little leggings sets - oh so cute and such pleasure to make. The leggings pattern is the Happy Baby pattern free on line. The pink Jacket is Rindy's Raglan, and the Camo jacket is a Tiny BSJ. The pale pink yarn is - you've guessed it - Panda Angoretta - the darker pink flecked with blue, red , yellow and green (honest!) 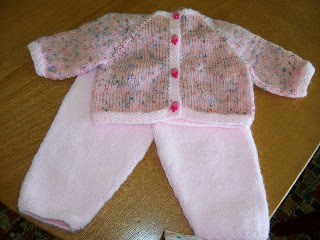 is Cleckheaton Fleur - this little set is sooooooo soft and cuddly! I LOVE this little set - so cute!! 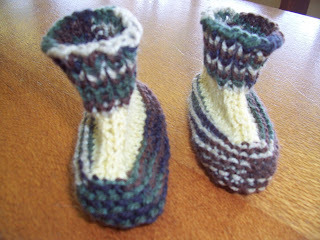 I invented a little round beanie to go with it - and tried to make the booties as much like army boots as I could! They aren't really different sizes - I just photographed them with one slightly forward of the other. Camouflage is Big W Carnival Effects yarn. The muted yellow is a Cleckheaton Crepe Yarn - machine wash wool. 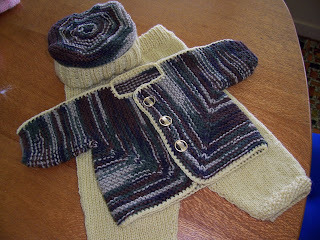 All these little outfits are being donated to Knitting for Brisbane's Needy.